TN Co-Founder Dante Trudel's signature all-purpose protein blend! True Nutrition proudly presents DC's All Day Formula, an all-purpose blend of time-sustained proteins that has been strategically-designed by True Nutrition co-founder Dante Trudel of DC Training fame! When combined with a rounded diet and exercise routine, the DCs All Day Formula can be used to help increase daily protein consumption while satiating hunger and offering time-release protein recovery over a period of several hours. DCs All Day Formula contains 25g of protein to help support muscle-building! Pea Protein Isolate, Egg White Protein. 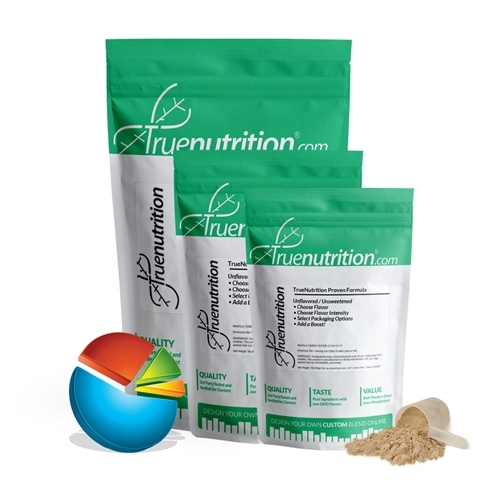 TrueFlavors: Flavoring (Natural Flavoring Extracts, non-GMO Rice Powder, Gum Acacia, Stevia). May also contain Guar Gum, non-GMO Tapioca Maltodextrin, and/or Cocoa Powder. Other Flavoring: Flavoring (Natural and Artificial Flavoring and Coloring, Acesulfame Potassium, Sucralose, Modified Food Starch, Silicon Dioxide, Maltodextrin). May also contain Guar Gum and/or Cocoa Powder. CONTAINS: EGG. Although this product may not contain one or all of the following, this product is manufactured in a facility that handles milk, soy, egg, peanut, nut, tree, fish, crustaceans/shellfish, and wheat products.